Men’s basketball: Rodney McGruder scored 22 points and surging, unranked Kansas State muscled past slumping No. 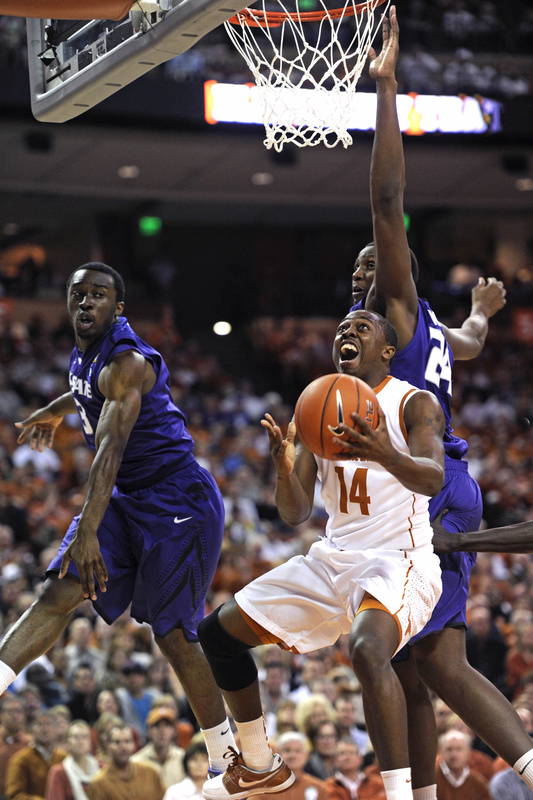 7 Texas 75-70 on Monday night, the Wildcats’ fifth straight win. Jacob Pullen scored 16 of his 20 points in the second half as Kansas State (21-9, 9-6 Big 12) sent the Longhorns (24-6, 12-3) to their second straight loss and third in four games. Tristan Thompson scored 26 points for Texas, but his teammates shot just 14 of 54 from the field. • Irish rain 3s to bury Villanova: Tim Abromaitis made a career-high nine 3-pointers and scored 30 points and Ben Hansbrough had 30 points and 10 assists in his final home game Monday night as No. 8 Notre Dame routed No. 19 Villanova 93-72 to secure a double bye in the Big East tournament. Notre Dame (24-5, 13-4) hit a school-record 20 3-pointers to beat the Wildcats (21-9, 9-8) and finish unbeaten in 17 games at the Purcell Pavilion, the only team in the league to be spotless on its home court. • Buckeyes bounce back to No. 1 spot: Ohio State returned to No. 1 in the Associated Press’ poll, the third straight week there was been a change at the top. Ohio State received 45 first-place votes from the 65-member national media panel, easily outdistancing Kansas, which moves to No. 2. BYU, which had five first-place votes, jumped from seventh to third, while Pittsburgh remained fourth, tied with Duke. Purdue, Texas, Notre Dame, San Diego State and Wisconsin round out the top 10. NBA: Channing Frye hit a 3-pointer with 6.6 seconds to play in overtime and the Phoenix Suns spoiled Deron Williams’ home debut for the Nets with a 104-103 victory over New Jersey in Newark, N.J.
Williams had 13 points and a season-high 18 assists, including five in rallying New Jersey from a seven-point deficit late in the fourth quarter. • Bibby contract bought out: Mike Bibby reached a buyout agreement with Washington, giving up $6.2 million rather than stay with the last-place Wizards. Bibby will receive the remainder of his $5.6 million salary for this season, but he gave up his entire amount of the final season of his contract for his freedom. • Calf injury sidelines Spurs’ Parker: Spurs point guard Tony Parker will likely miss two to four weeks with a sore calf muscle. Parker strained his left calf in Sunday’s win over Memphis. • Cavaliers lose Jamison: Cavaliers forward Antawn Jamison will likely miss the remainder of the season with a broken finger that will require surgery. Women’s basketball: Shareese Ulis scored 20 points and led a 3-point barrage that led Cincinnati (9-19, 2-14 Big East) to a 65-62 victory over No. 20 Marquette (22-7, 10-6) in Cincinnati, ending the Bearcats’ 13-game losing streak. Cincinnati was 13 of 29 overall on 3-pointers. • South Florida takes down Georgetown: Leondra Doomes-Stephens had a career-high 25 points and 13 rebounds, Andrea Smith scored 24 points, and South Florida (12-18, 3-13 Big East) beat No. 17 Georgetown (21-9, 9-7) 60-55 in Tampa, Fla.
NHL: Patrick Sharp and Jonathan Toews each scored in the second period, and the Chicago Blackhawks stretched their winning streak to a season-high five games with a 4-2 win over the Minnesota Wild in St. Paul, Minn.
Tomas Kopecky also scored in the second and Marian Hossa sealed the game with a short-handed goal with 1:52 remaining. Auto racing: Morgan Lucas defeated Shawn Langdon in the Top Fuel final Sunday at the season-opening NHRA Winternationals in Pomona, Calif.
Lucas powered to a run of 3.835 seconds at 316.38 mph.